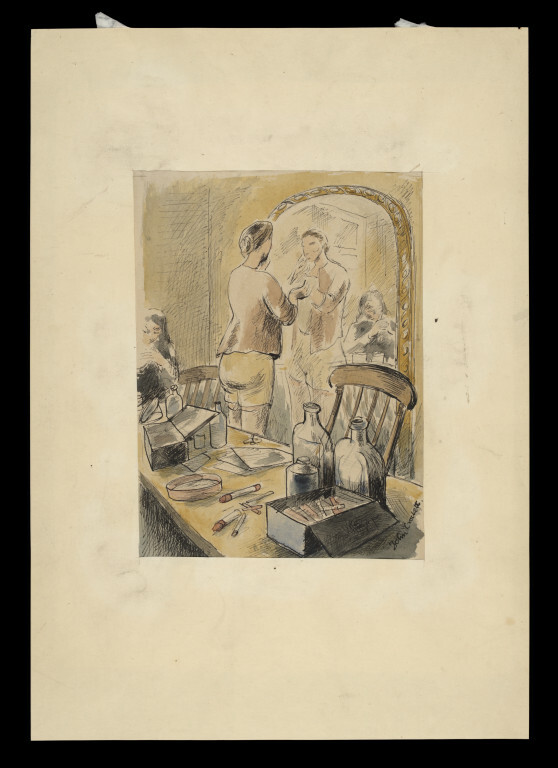 John Crockett's drawing shows an actor making up for a performance by The Compass Players, a small post-war British touring company dedicated to producing a repertoire of classics. Their work incuded Marlowe's Dr. Faustus, plays by Shaw, Synge, Chekhov, Moliere, Fry, Milton's masque Comus, and exciting versions of Chaucer's The Pardoner's Tale, and Jonah and the Whale - both adapted by John Crockett, the company's artistic director as well as a dancer and an accomplished artist. Actress making up in a dressing room for a performance by the Compass Players. 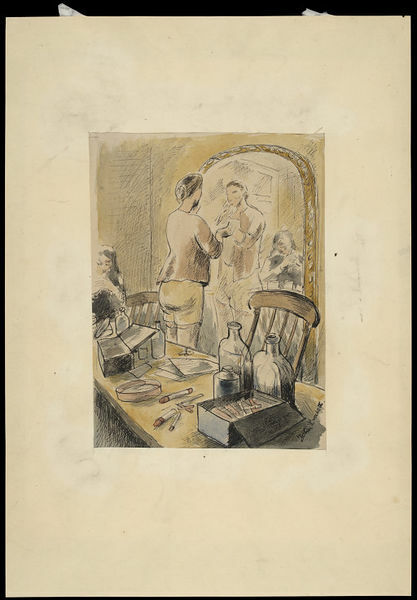 Pen and ink and watercolour drawing showing an actress, centre, wearing a tan-coloured shirt and beige shorts, standing with her back to the viewer, at an oval-topped framed wall-mirror, applying make-up or cream to her neck with her right hand. 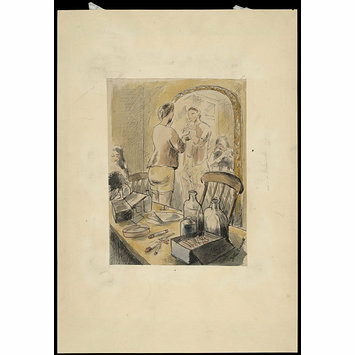 Behind her are the backs of two Windsor chairs which are drawn up to a table in the foreground covered with make-up, bottles, a make-up box, sheets of paper and sticks of greasepaint. Another female figure can be seen sitting at the table to the left of the picture, her hands clasped in front of her, and her reflection can be seen in the mirror beside that of the actress making-up. Actress making up in a dressing room for a performance by The Compass Players. Pen, ink and watercolour by John Crockett, ca.1946. John Crockett Collection.